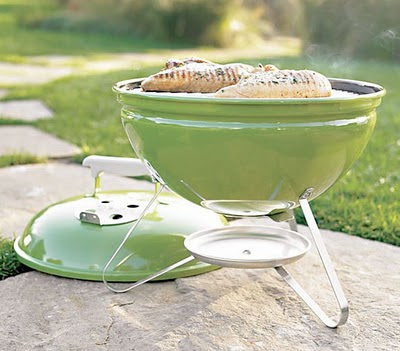 Green Smokey Joe - The BBQ BRETHREN FORUMS. Is this a rare color? Someone is selling a used one for 20 bucks. Not sure if it's a score or something I can get anytime. It's $20. Buy it, and figure the rest out later. Rare or not it is sweet! I 2nd the buy it $20 is worth it. It's all the way across town. It's going to cost me about 10 bucks to get there and back in gas. I can get a new black smokey joe for 30. I'm torn. Think of the Nostalgia. My parents had kitchen appliances that color (in the 70's). Don't laugh, my kitchen tile is very similar in color. When you show up to a BBQ or tailgate with that portable avacado you'll get a lot of love, black well that's what everyone else has. Weber 18 WSM, 2002 (DU) Weber Performer, Weber Kettle L.
The Anchormen, Rhode Island's Original Competition BBQ Team. That's the motivation that I needed. I'm going to see if I can get this tonight. FYI: Sold by crate and barrel. That thing is sweet! $50.00 brand new at Crate & Barrel.. I'd grab it. If it was a Redhead, I'd be all over it! I emailed the seller. I'm going to offer him 15, as I have to drive across town to get it. i'm cheap but i'd pay that. going to get it is called a "road trip" !